Muscadines are a grapevine species native to both North and South America. Also known as America’s first grape, muscadines have had a long history of cultivation that dates back to the 1500s. 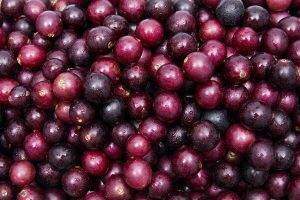 The fruits are characterized by their sweet flavor and varying range of colors including green, bronze, reddish-purple and black. Muscadines are often compared to the jaboticaba fruit for their appearance and flavor. Muscadine grapes are a rich source of potent nutrients that help protect the body against a host of diseases. Separate entries posted on the Muscadine Naturals and Health Grove websites enumerate the important vitamins and minerals found in muscadines. Muscadine grapes are a rich source of dietary fiber that help facilitate the digestive process. In fact, the U.S. Department of Agriculture notes that a single serving of 35 muscadine grapes may provide up to 105 calories and seven grams of fiber. This, compared to the 104 calories and only 1.4 grams of fiber found in a serving of seedless grapes. This means that a single muscadine fruit contains as much fiber as five seedless grapes. The fruit’s thick skin contains ample soluble fiber supply that promotes regular bowel movement and helps stave off a host of digestive system conditions such as constipation, hemorrhoids, and diverticulitis. Likewise, the high water content in muscadines is touted to promote satiety. On the other hand, the fruits’ ample fiber supply is also found to defer gastric emptying. This makes muscadine grapes a remarkable superfood for weight loss. Muscadine grapes are also found to contain natural compounds that slash cancer risk. A previous study showed that muscadine grapes are notably high in ellagic acid. According to the American Institute for Cancer Research, the powerful compound is known to inhibit cancer cell reproduction. On the other hand, the superfood is valued for its abundant vitamin C supply, which helps fortify the body’s immunity against diseases. Muscadine grapes are found to contain twice as much vitamin C as regular seedless grapes. A single serving of about 35 muscadine grapes may provide as much as 14 milligrams of vitamin C, or 23 percent of the daily recommended intake of the essential vitamin. In addition, muscadine grapes are an excellent source of antioxidants that combat the harmful effects of free radicals. The high antioxidant content in muscadine grapes are touted to reduce oxidative stress to the heart. This makes the fruit a powerful superfood against a plethora of cardiovascular diseases. The fruit is also known to bolster the body’s overall circulation. Likewise, muscadine grapes are notably effective in regulating the body’s blood glucose concentrations. Furthermore, the superfoods are touted to promote brain protection and prevent the onset of Alzheimer’s disease. Muscadine grapes are especially beneficial in keeping a healthy digestive profile. Likewise, the superfoods are notably effective in boosting the body’s immunity and promoting the cardiovascular system. In addition, the fruits are found to improve both the circulatory and nervous systems. Just like regular table grapes, muscadines are especially useful in making various baked desserts such as cakes, tarts and pies. Likewise, the fruits are ideal in making preserves, marmalade and jellies. Muscadines can also be incorporated in a wide range of meat dishes. In addition, the fruits can be processed into wine. An entry posted on Cooks.com features interesting muscadine recipes. Muscadine grapes prevent cancer, digestive issues, and cardiovascular diseases. Muscadine grapes stave off infections, diabetes, and Alzheimer’s disease. Muscadine grapes benefits the digestive, cardiovascular, circulatory, and nervous systems.